Contains premium organic and wild-crafted: Orange, Grapefruit, Galbanum, St. John's Wort , Hyssop, and Juniper Berry essential oils. 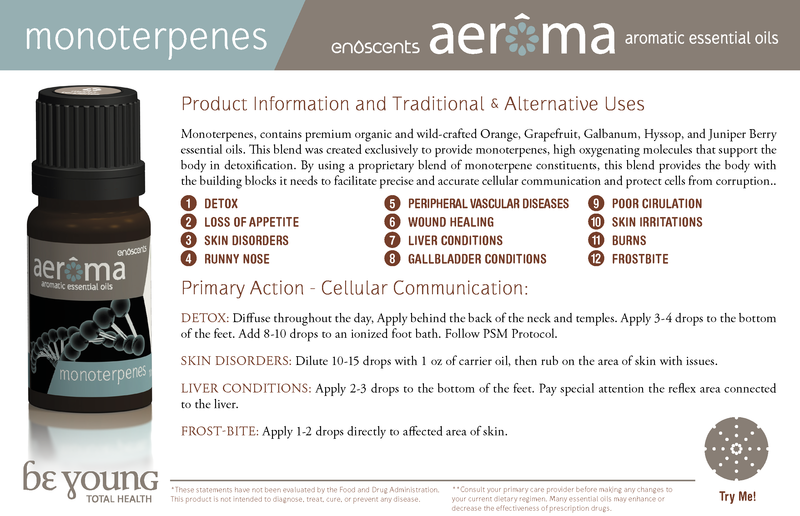 Monoterpenes™ is packed with essential oils featuring high levels of protective compounds known as monoterpenes. These compounds guard protein and DNA oxidation and damage. The synergistic effects of the essential oils within Monoterpenes™ have been said to exhibit powerful protective, communicative, and reconstructive properties at the cellular level. Apply a few drops in the palm of the hands and inhale. You can also run it through your hair to leave a lingering effect of the essential oils for inhalation. Best if used with Phenylpropanoids™ blend and Sesquiterpines™ blend. Use directly after using Sesquiterpines™ blend. Odour: Fresh, green, balsamic and earthy odor. Use Masaji™ with the Monoterpenes™ to help control further DNA damage caused from free radicals.